When Officer Danny Boyle, of the Sea Haven Police Department, receives a 911 call, he rushes to the destination to find that a good friend Christine Lemonopolous is in a knock down drag out fight with Shona Blumenfeld Oppenheimer. 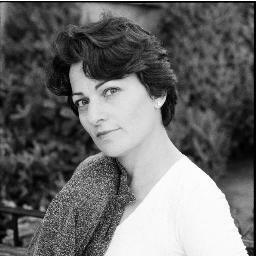 Shona is the mother Samuel Oppenheimer who is in a wheel chair. Christine is his nurse but when war broke out between the two women Samuel made a call to the police. Danny and his partner Salvatore Santucci break up the fight. Christine had been staying at the Oppenheimer residence and Ms. Oppenheimer immediately evicts her. Christine agrees to leave and Danny and his partner write up a report on the incident. Christine informs Danny that she also nurses for Dr. Rosen and she feels sure he will allow her to stay at his residence. Detective John Ceepak, Danny’s former partner, calls Danny in for assistance on occasion. Danny gets a call and finds out that Christine has slept in her vehicle rather than ask Dr. Rosen to stay at his home. Neighbors called the policy and Detective Ceepak suggested that rather than allow Christine to be arrested for vagrancy Danny turn over his apartment to Christine until better accommodations could be found. Ceepak suggested that Danny stay with him until Christine got settled. Detective Ceepak’s mother is now residing in Sea Haven and living very comfortably. Her aunt left her a nice inheritance. When Detective Ceepak and Danny go to inspect the rides prior to the opening of the amusement park, they learn that the owner of the new ride “Free Fall” has hired Ceepak’s father to operate the ride. There is a lot of bad blood between Ceepak and his father Joseph Ceepak who is only around to try to collect money from his ex-wife’s inheritance. Ceepak and Danny have enough to worry about with the Christine problem and Joseph Ceepak in town trying to contact his ex-wife to take over her inheritance when Dr. Rosen drops dead. It appears that the death could be suspicious. 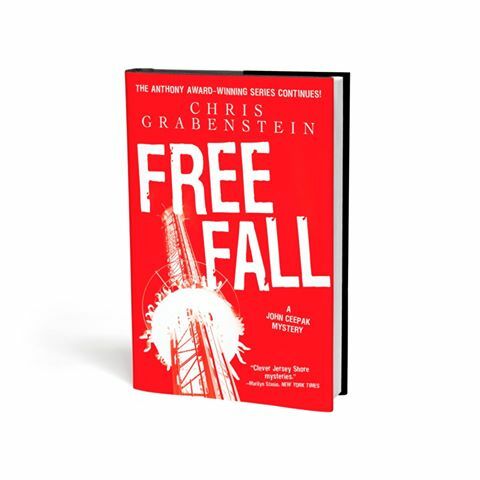 Free Fall is a great addition to the John Ceepak Mystery series. Danny Boyle has matured considerably since the beginning of this series. Even though he is still the same fun loving Danny, he is picking up more of Ceepak’s habits every day. 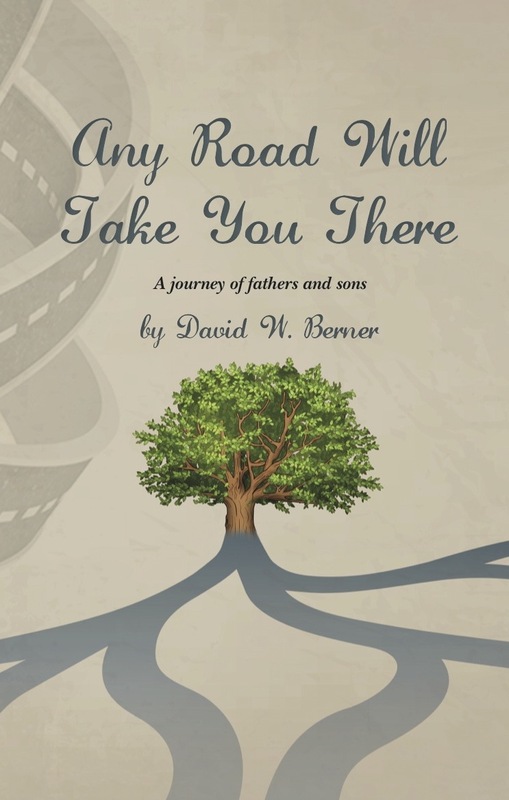 David W. Berner is an award-winning journalist, broadcaster, author, and teacher. His first book, Accidental Lessons was awarded the 2011 Royal Dragonfly Grand Prize for Literature. His broadcast reporting and audio documentaries have been aired on the CBS Radio Network, NPR’s Weekend Edition and a number of public radio stations across America. David has been the recipient of awards from the Associated Press, RTNDA (Radio and Television News Directors Association) and the Broadcast Education Association. David was awarded the position of Writer-in-Residence at the Jack Kerouac Project in Orlando, Florida for the summer of 2011. His writing, both reporting and personal essays, have appeared in publications and online journals such as Under the Gum Tree, Chicagoland Journal, PERIGEE, Tiny Lights Journal, Shaking Like a Mountain, Travelgolf.com, Worldgolf.com, Golf Chicago Magazine, The Sun Newspapers, and Write City Magazine. David is also a performer. He’s a regular on the Chicago storytelling circuit, reading his personal essays at events such as 2nd Story, Story Club, Essay Fiesta, and This Much is True. 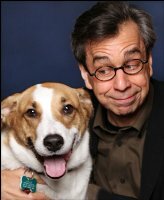 As an associate professor at Columbia College Chicago, he teaches radio narrative, audio documentary, and writing. He has presented writing workshops at the University of Wisconsin-Milwaukee and for numerous literary organizations throughout the Chicago area. David holds a Masters in Education/Teaching from the Aurora University and a MFA in Creative Writing from Fairleigh Dickinson University. And with all of this, David still finds time to play guitar and watch as much TV coverage as possible of his beloved Steelers. PJ: David, how long have you been writing? DB: I wrote my first “book” when I was seven years old. It was an assignment for an elementary school class. It was called “The Cyclops,” a story about a deep sea monster that ate ships and ocean divers. I evolved, if you will, when I began writing news for radio in the early 1980s. I was writing journalism, writing a regular column on golf and other matters for a local paper, when I was in my mid-30s. I wrote a lot of bad fiction that ended up in a desk drawer somewhere in my late 30s. In my 40s, I began to write more seriously and began writing my first book, Accidental Lessons, in 2004. PJ: At what point did you reach a place where you felt successful as a writer? DB: I don’t ever feel “successful” as a writer. It’s always a journey; it’s always a struggle. Success to me is about the final artistic product. So, next week I could feel successful as a writer and then the week after, I may not. PJ: Is the writing life what you expected when you started out? If not, how is it different? DB: I expected nothing. Honestly, I wrote because I loved a good story. Money, success (whatever that means) was never, and still is not the reason I write. PJ: The general public seems to think authors are relatively wealthy. Without prying too much, has your writing income lived up to expectations? DB: I never had expectations. Still don’t. Don’t plan on having any. It’s funny, most people think of other kinds of artists (painters, actors) as “struggling” — but for some reason, authors are rich. Why is that? LOL. Most writers are far from rich, even some of the best struggle financially. And in a perfect world, writers should NEVER be rich. It has a tendency to corrupt. PJ: Early on, so much focus is given to getting published. Now that you’re published, how has your focus changed? DB: I do workshops a lot and tell participants: “You have to ask yourself, do you want to be published or do you want to write?” They are two different things. If you want to be published, and that’s all you really want, then write something about vampires, because that’s what sells at the moment, just to make a point. But if you want to write, then write about things you love, interest you. And maybe eventually, if you learn to tell a good story about those things, you may…may…get published. For me, I think only about writing. Publishing is a by-product. Do I want my work out there? Certainly. But I’m not going to write just to get published. PJ: Very good points. How long did it take you to get published the first time? DB: It took six years to write my first book. It took five months to get a publisher. I was lucky. That is not the norm. Getting published in online journals, magazines, or newspapers was different. I got an assignment, wrote it, edited it, and it appeared. Different process. PJ: Would you do anything differently if you had it to do over again? DB: No. My bad writing led to my better writing. My mistakes led to my good decisions, good ideas. All of that had to come first before I got better. And I’m still learning. I’m sure I’ll make more mistakes. PJ: Writing new material, rewriting, submitting new work, waiting, promoting published work…the list is large. How do you manage to divvy up your time to give adequate attention to all needed areas? DB: That’s a struggle. I teach at college, I also do a lot of broadcast work and journalism. So, I’m always juggling. I haven’t been writing a lot lately and I don’t like that. I’ve been working getting a new book out there. I also have a novel with my agent, a novel I finished last summer. I’m sure I’ll be working on fine-tuning that novel this summer after my agent gets a close look. She’s a good judge and critic. I try to take a couple days every month to submit shorter work. I try to mix my writing days with my submitting days. That doesn’t work for me. And I also do a fair amount of storytelling projects, live literature in Chicago like Essay Fiesta, 2nd Story, and Story Club. PJ: What is the single most exciting thing that’s happened to you as a writer? DB: My first book. There’s nothing like holding that in your hand. PJ: What is the single most disappointing thing that happened to you as a writer? DB: “Disappointing” may be too strong a word, but it was tough to get rejection letters over and over and over again for my current manuscript, not because they didn’t like it, in fact many said they loved the story and the concept, but rather because it just wasn’t “right for them right now.” That’s usually code for, “we know this isn’t going to sell a million copies and the publishing world is a rocky place and we are not prepared to take a risk on this, even if it’s good.” That’s frustrating, but it’s reality. PJ: What’s the most memorable thing (good or bad) that’s happened to you while promoting your work? DB: The first time someone came up to me at a reading/signing and said, “Your book changed me.” I actually had that happen, in so many words, a number of times. But the first time is amazingly humbling. 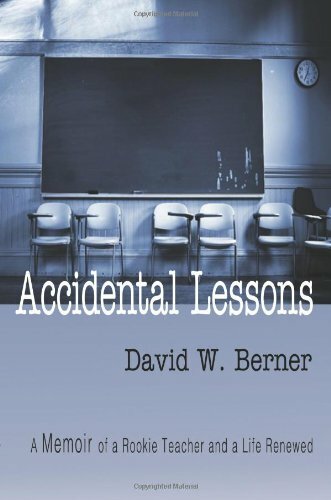 Accidental Lessons, my first book, is a story about a year of teaching in a troubled school wrapped around a very personal story of discovery and life-changes. Knowing that this personal story resonated so strongly with the reader is incredibly satisfying. PJ: With more books being released each month now than ever before, what do you believe sets your work apart from the others? DB: Admittedly, I am a little uncomfortable talking about what makes my writing different. I think that’s up to the reader to say. But I can tell you that I have had many people say that my stories – especially the memoir/creative nonfiction writing – makes them laugh and cry, and illuminates something in their own personal life. PJ: What would you like to share with writers who haven’t reached the point of publication yet? DB: Keep writing. Don’t worry about publishing. Write because you love it. And submit, submit, submit. Send material to journals, your local newspaper, whatever. Writing is like working out — to get better and published you have to keep writing, like you have to keep working out to lose weight, get in shape. It must be part of your life. PJ: What do you feel is your most effective tool for promoting your published work? DB: Personal appearance, readings. I love talking to potential readers. PJ: What area of book promotion is the most challenging to you? DB: Probably the same as what I think is the most effective – personal appearance, readings. PJ: Do you have a local independent bookseller you’d like to mention? 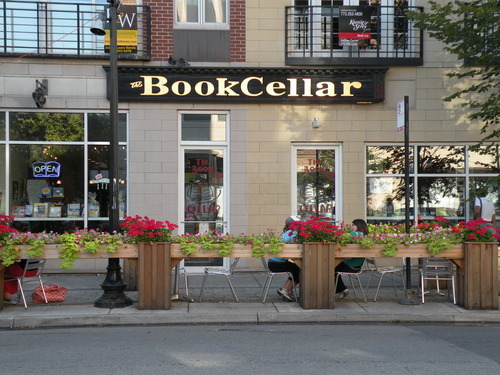 DB: I love The Book Cellar in Chicago. Accidental Lessons: A memoir of a rookie teacher and a life renewed. A middle age father, hoping to rekindle a new fire in his life, re-reads Jack Kerouac’s iconic road trip story, On the Road, and uses it to take the 5000 road trip he never took as a young man. This time though, he brings along his two sons and discovers a deep appreciation for his role as a father, and is forced to come to terms with all the fathers who came before him. Amazon is the best place to find it. But bookstores, if they don’t have it, can order it. Just ask them. PJ: What last thing would you like to share with us that nobody knows about you and your work? DB: I worked hard to be a good writer. It’s work. And I’m still working on it. And when I read great writing, I question my abilities. But in the end, I get right back at it because I am, eventually, inspired. I just re-read the first 300 words of Denis Johnson’s award winning book Tree of Smoke and was just blown away, again. I am inspired everyday by good writing. Another thing someone might not know about me — I cry at movies, and every time I hear Bob Dylans’ Girl from the North Country, I tear up. I can be a softy. And one other thing – I may live in the Chicago area…but I’m a Steeler fan. Always will be. Sorry, Bears. David, thanks for taking time to share with us! I love Any Road Will Take You There and strongly encourage everyone to get a copy! It’s pretty much an article of faith now that a published or soon-to-be-published author needs a website. No matter how much other social media you participate in, the website is the foundation of all your efforts, the place that houses the most important information about who you are, what you’ve written, and how to order, and why readers would want to buy your books. To ensure your website offers you the maximum benefit, here are a few things that it really has to have. A warm, attractive home page that welcomes readers and presents yourself and your books in an intriguing way. It should invite viewers to stay a while and investigate further. Attractive design, with a nice color palette and balanced layout makes you look more professional as well as letting viewers enjoy the experience. And of course, you want to be sure that your navigation is clear, consistent, and easy to use. A page for your book or books. This should show covers and order information (preferably linked to the order pages for your book at various online vendors) for each book. I suggest listing them in reverse chronological order with the most recent first, the one exception being that if you have books in a series, those should always be listed together. If you have a backlist of more than one or two books, a printable booklist (either a text file or PDF) is always appreciated by readers. A News/Coming Soon page. One of the most common reasons for a reader to visit an author’s website is to find out about what the next book will be and when it will be available. They’d also like to know if you’ll be doing an appearance or book signing somewhere near them. A bit about yourself. Readers like to know something about the person who wrote their favorite story. You’re a celebrity to your readers, and we’re all curious about celebrities. So let them know where you live (roughly – don’t ever publish your actual street address on your site; city or region is good enough), what you do if you have a day job that isn’t writing, what your hobbies and interests are. A way to contact you. There’s a lot of disagreement about the best way to do this. Five years ago, I was advising authors to put an email link on their site, until spammers began combing the web to find email addresses to hack and spoof. I switched to suggesting using a contact form, and I’ve installed a number of them. In the last year or so, however, those forms are being spammed and, if they’re not set up properly, can even be used to relay large quantities of spam. And finally for the things you don’t want on your site. Boiled down, you want to avoid anything that will make visitors leave more quickly. That includes music that autoplays, too many moving or slow-loading displays, and confusing navigation that changes from page to page. The auto-playing music should be self-evident. Many people surf during down-time at work or in rooms with other people. That great oldies song you love may be like fingers on chalkboard to other people. If you want to put music on your site, give your viewer the option of turning it on. Flash displays were popular for a while because they provided classy animations that could compelled attention and interest. But those lovely displays often were slow to load and offered jerky displays. And today Flash doesn’t work on many phones and tablets. Better to limit your use of Flash. And do I really need to mention how annoying a lot of little blinking objects are? One or maybe even two you can get away with. Any more than that and you’re overdoing it. 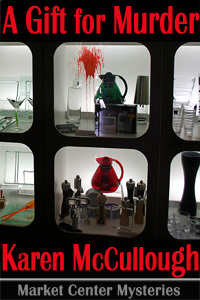 Karen McCullough is a web designer by profession, and the author of a dozen published novels and novellas in the mystery, romantic suspense, and fantasy genres as well. She has won numerous awards, including an Eppie Award for fantasy, and has also been a four-time Eppie finalist, and a finalist in the Prism, Dream Realm, Rising Star, Lories, Scarlett Letter, and Vixen Awards contests. 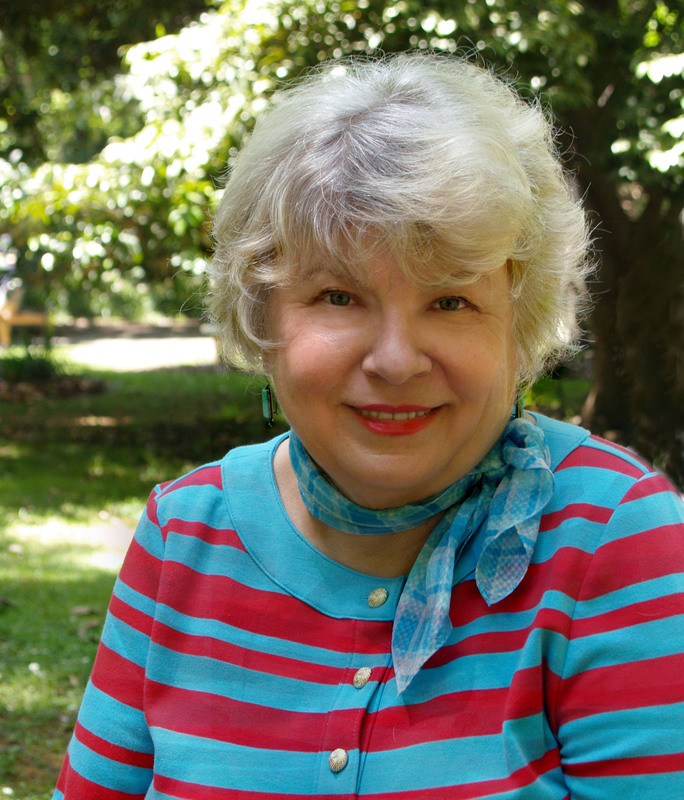 Her short fiction has appeared in several anthologies and numerous small press publications in the fantasy, science fiction, and romance genres. She has three children, three grandchildren and lives in Greensboro, NC, with her husband of many years. For fifty-one weeks of the year, Heather McNeil loves her job as assistant to the director of the Washington DC Market Show Center. But the Gift and Home trade show, the biggest show of the year at the center, is a week-long nightmare. This year’s version is worse than usual. Misplaced shipments, feuding exhibitors, and malfunctioning popcorn machines are all in a day’s work. Finding the body of a murdered executive dumped in a trash bin during the show isn’t. The discovery tips Heather’s life into havoc. The police have reason to suspect the victim’s wife killed him, but Heather doesn’t believe it. She’s gotten glimmers of an entirely different scenario and possible motive, but questioning exhibitors about the crime doesn’t make her popular with them or with her employers. Still, other lives might be at risk, and if she doesn’t identify the murderer before the show ends, the culprit could well remain free to kill again. Her only help comes from a company executive with ulterior motives and the Market Center’s attractive new security officer, Scott Brandon. Despite opposition from some of the exhibitors, her employers, and the police, Heather seeks to expose the killer before the show ends. To solve the mystery she will have to risk what’s most important to her and be prepared to fight for answers, her job, and possibly her life. Karin Schaeffer and her husband, Mac MacLeary, are just beginning to feel like a normal, married couple. The terrors that invaded their lives on more than one occasion have now been put behind them. Mac is running a private investigation agency and Karin is working with him. The children are happy and life is good. When Cathy Millerhausen hires Mac to investigate her husband billionaire, Godfrey Millerhousen, Mac agrees. Cathy fears that Godfrey is unfaithful and if a divorce is in the future, she is afraid that her income will not be sufficient to cover the cost for their son’s special needs treatments. 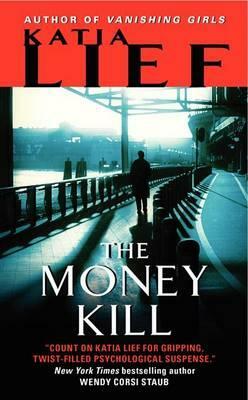 Mac has become convinced that Mary’s fears of Godfrey’s unfaithfulness are unfounded and so when he is offered a job in London with a large paycheck he puts the Millerhausen case on hold. The offer of a family vacation on the Mediterranean island of Sardinia is part of the deal making it extra hard to pass up. Mac and Karin agree to swap houses with the Sardinia family. Mac’s assistant Mary and her son Fremont take the children and go ahead to Sardinia to wait for Mac and Karin. Although at first it seems like paradise, strange things begin to happen. Mac and Karin lose contact with Mary and the children. They have disappeared and Mac and Karin risk everything to locate their family. Once again, their family is in turmoil. Katia Lief’s books are always full of suspense so be ready to keep the pages turning swiftly once you pick up a Lief book. Previous books are “You Are Next”, “Next Time You See Me” and “Vanishing Girls”. Sue Owens Wright was one of my first clients ever and I’m honored to still be working with her today. I hope you all enjoy what she has to say and know that if you haven’t yet met Beanie and Cruiser, you’ll really be glad you did! PJ: How long have you been writing? Sue: I started writing poetry when I was in my teens and was first published then. I didn’t start writing fiction until the 1990s. Sue: There have been several points. When I received my first book advance, earned some decent royalty checks, won two Maxwell Awards, and when I began being interviewed and written about. Sue: I could never have predicted the many surprises and blessings that have come my way from following my heart and writing what I’m passionate about… dogs and basset hounds, in particular. Sue: Not yet, but I’m closer than when I first started out. I think most beginning writers have unrealistic expectations about income, thinking they’ll be instantly rich. Some fortunate writers do hit pay dirt right off, but it finally boils down to whether you love writing or not, and I do. Sue: I focus on writing the next book. PJ: How long did it take you to get published the first time? Sue: A couple of years and 18 rejections, which isn’t so bad when you consider all the famous authors who received many more rejections before their first publication. Sue: I’d have held out longer for a series contract from one of the big dogs of publishing when I was searching for someone to publish my first mystery. I got too antsy to sign a contract, but hey, at least I got published. Sue: I need a few more heads for the hats I wear, and balancing it all can be challenging. It’s easy to get caught up in the promotion part and not spend enough time writing, but I balance my time pretty well. I do a little promotion each day and then get down to the writing and polishing what I’ve already written, though on some days promotion takes up more time than I intend. I probably don’t submit as much new work as I should. When I do, I don’t waste time fretting about what I’ve sent out. It’s done and gone. I let it go and move on to the next writing project. Of course, I’d rather be devoting all my time to writing books, but if no one knows about them they won’t get read, and writers want to be read. Sue: Winning two Maxwell Awards and being nominated a total of 10 times for this prestigious award by the Dog Writers Association of America for the best writing on the subject of dogs. Sue: Missing a chance at landing a contract with a big NY publisher. Sue: When I was invited to be a guest speaker at the Illinois Basset Waddle, where I witnessed the spectacle of 1,000 hounds waddling through the small town of Dwight. I later wrote about the event, which garnered me my first Maxwell Award. Sue: I think it’s my passion for basset hounds and my knowledge and understanding of these endearing drool-slingers I’ve lived with for almost 40 years. 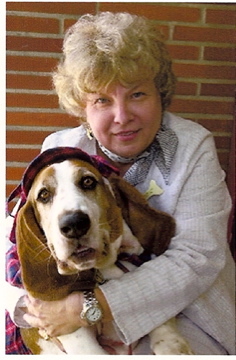 I never knew there were so many devoted basset lovers worldwide until I wrote these books. People are just crazy about those dogs. My Lake Tahoe setting is also intriguing to readers. Sue: Never give up! Learn your craft and constantly improve your skills. Keep writing and then submit only your best work. It’s persistence that eventually separates the published from the unpublished. Be like a basset hound. It requires the dogged determination of a scent hound to keep following that trail to publication, but you’ll be rewarded in the end. Sue: I’ve found the Internet and Facebook very effective. Whenever I write an article or a pet column or do an interview, it reaches a worldwide audience instantly. I have readers from just about everywhere you can name. I’m so thankful to be a writer living in the Internet Age. Sue: TV interviews. I sometimes tend to freeze when in front of the camera. I think I must look like a deer in the headlights, but it always seems worse at the time than when you look back at the footage. It’s hardly a blip on the screen. Now if they could only find a way to make you look younger and skinnier on camera. Sue: Face in a Book, which is located in El Dorado Hills, CA. Beanie encounters calamity in one way or another when she volunteers to foster a homeless basset hound from Lakeside Animal Shelter. 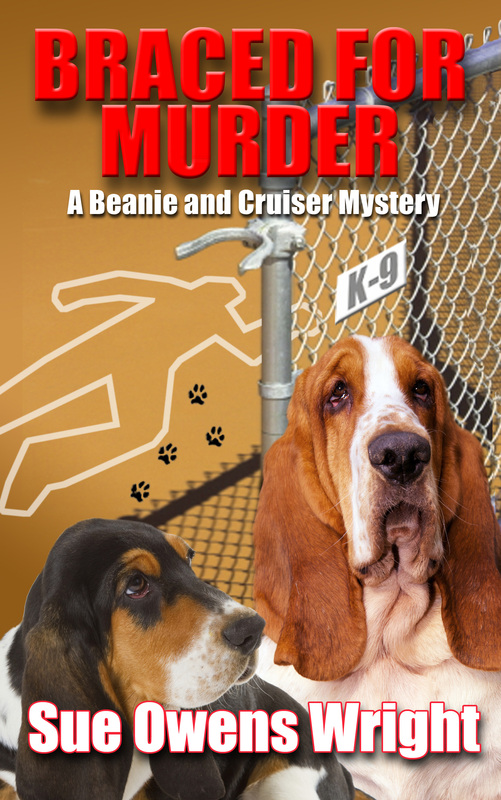 After she discovers a reviled shelter manager was euthanized, Cruiser, and his naughty new sidekick, Calamity, pair up to track the killer and save Beanie from a cruel death at the dog pound. Five Star/Cengage Publishers, bookstores, and online booksellers. Braced for Murder will also be available on Kindle. What last thing would you like to share with us that nobody knows about you and your work? The first book I ever wrote was a paranormal romance set in England. I was inspired to write it after touring southern England and Cornwall in the early 90s and stayed at a fantastic Tudor estate that was supposedly haunted. I recently revised it and am seeking a publisher for the book. 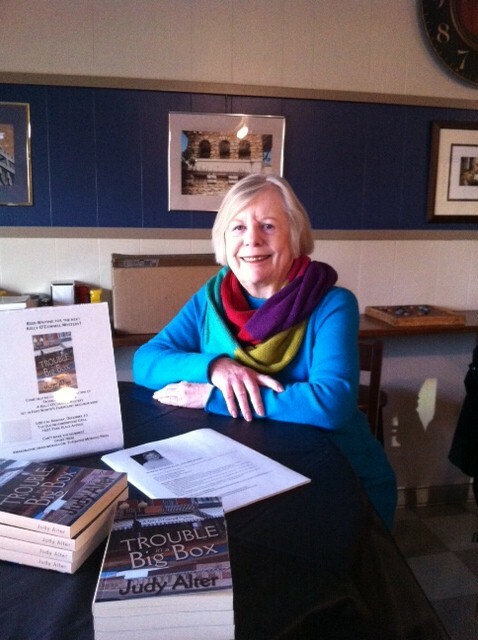 It always helps to have a good publicist to get the word out and to book events for authors. PJ Nunn and her team at BreakThrough Promotions have been there for me from the beginning, opening doors that I probably could never have opened for myself. “Write about what you know,” the advice given to new writers, is sound advice. Since my career was in the diplomatic service, it seemed logical to me to write about that world. And the more I thought about it, the more I realized that it would be a good idea to have a diplomatic sleuth, a sort of Sherlock Holmes in black tie. And this was the thought behind my creation of a new subgenre, which I call “diplomatic mysteries.” The series introduced several continuing characters, of course starting with my protagonist, a thirty something career Foreign Service Officer named Robbie Cutler. We will see his career advance from embassy to embassy in a variety of jobs, just as happens in the real career Foreign Service. In the most recent novel, “The Saladin Affair,” he is Special Assistant to the Secretary of State, and must contend with Al Qaeda during the Secretary’s first official overseas trip. Continuing characters start with his girl friend Sylvie Marceau, who helps him solve several murders in “Vintage Murder,” the first book in the series. They become engaged in “Murder on the Danube,” and the third book, “Murder in Dordogne,” takes place on their honeymoon. Everyone’s favorite character, it seems, is Robbie’s Great Uncle Seth Cutler. He is a nationally prominent educator and former intelligence operative. I invented him, frankly, to give Robbie Cutler access to high level intelligence information in Washington. Robbie’s sister Evalyn keeps her brother out of trouble from time to time, when she is not a potential victim of terrorism herself! One of the threads linking the series is Robbie’s interest in good wines. (I served as Consul General in Bordeaux, and have written extensively about wines.) This has actually become something of a promotional device at retail wine stores, which might not otherwise be expected to feature mystery books. 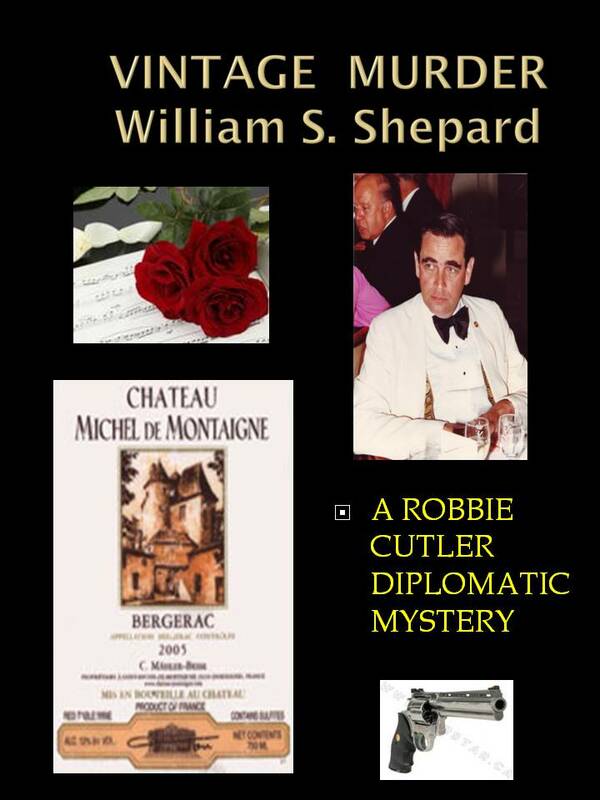 “Vintage Murder” is set in Bordeaux, and on the cover is the wine label for Château Michel de Montaigne, a property actually owned by Montaigne which now produces wine. A key scene in the novel takes place there. I’m told that the estate now features this book in its gift shop. 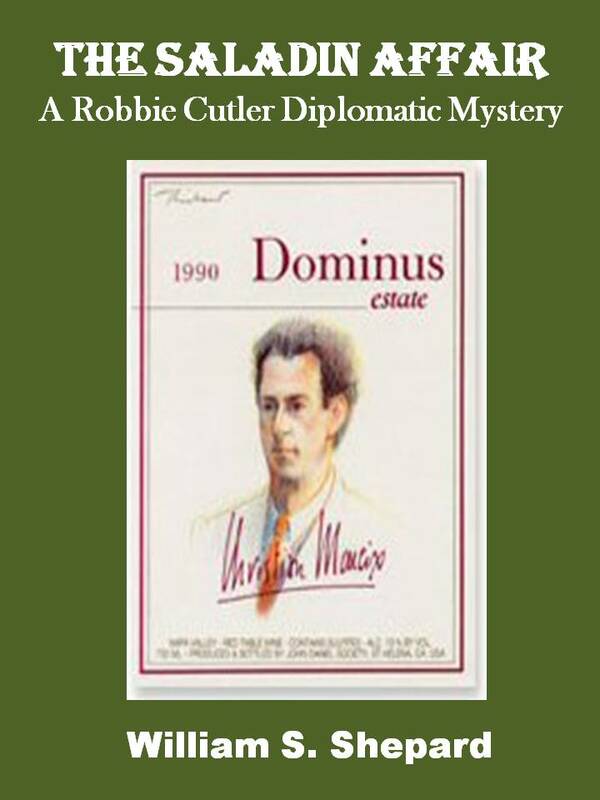 Wine labels are used, by permission of course, in each novel in the diplomatic mystery series. In the latest, “The Saladin Affair,” the label is of the Dominus California wine, which is owned by the celebrated Bordeaux wine authority, Christian Moueix. The wine is of course also mentioned in the novel itself. 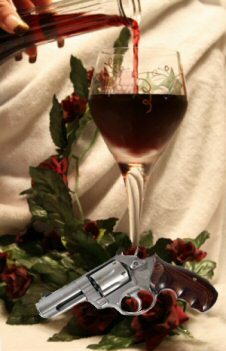 This becomes a sort of product placement, and when the book was published, the estate ordered a number of copies of the mystery for its wine clientele. There is no reason why other products cannot be used in the context of a mystery novel, just as products have been displayed prominently for many years in films. With diplomacy, wine is a natural. With your book, it may be another product. Let your imagination be your guide! Now residents of Maryland’s Eastern Shore, the William and Lois Shepard enjoy visits from their daughters and granddaughters, ocean swims at Assateague, Chesapeake Bay crabs, and the company of Rajah and Rani, their two rescued cats. Shepard has published several books using the new EBook technology, including “Coffee Break Mysteries,” “The Great Detectives (From Vidocq to Sam Spade),” and “Maryland In The Civil War.” The last two grew out of his lectures under the continuing education program at Chesapeake College. Shepard notes that he started researching “Maryland In The Civil War” out of his longstanding interest in the overall subject. What he discovered, however, was astonishing – the role of a largely unknown Maryland Governor, Thomas Hicks, in keeping our state in the Union in 1861. It is a story as heroic as any in Kennedy’s Profiles In Courage, and one that should be more widely known. Shepard, a prize winning mystery writer, is also the creator of a new genre, the diplomatic mystery, now comprising four novels whose plots are set in American Embassies overseas. That mirrors Shepard’s own career in the Foreign Service of the United States, during which he served in Singapore, Saigon, Budapest, Athens and Bordeaux, in addition to five Washington tours of duty. These books explore this rich, insider background into the world of high stakes diplomacy and government. Shepard is Wine Editor for French Wine Explorers (www.wine-tours-france.com) and is also the author of Shepard’s Guide to Mastering French Wines. Kate’s life has just been turned upside down. Her twin sister, Donna’s, call has changed the world she once knew. Her beloved Gram is dead, found face down in a pot of mashed potatoes at the Blue Plate Café she owned. Kate cannot believe this as she just saw Gram a couple weeks before in her home town of Wheeler, Texas when she visited on a break from her fast paced life working for a large legal firm and living the high life in Dallas. Kate immediately packs and leaves for Wheeler. She must make the funeral arrangements and reconcile in her mind that her Gram is truly gone. Once at home, she discovers Donna, her twin, is not really all that devastated by their Grandmother’s death but more concerned about when the will is to be read and when she can open her new bed and breakfast with her shady partner, Irv Litman, a high roller from Dallas. 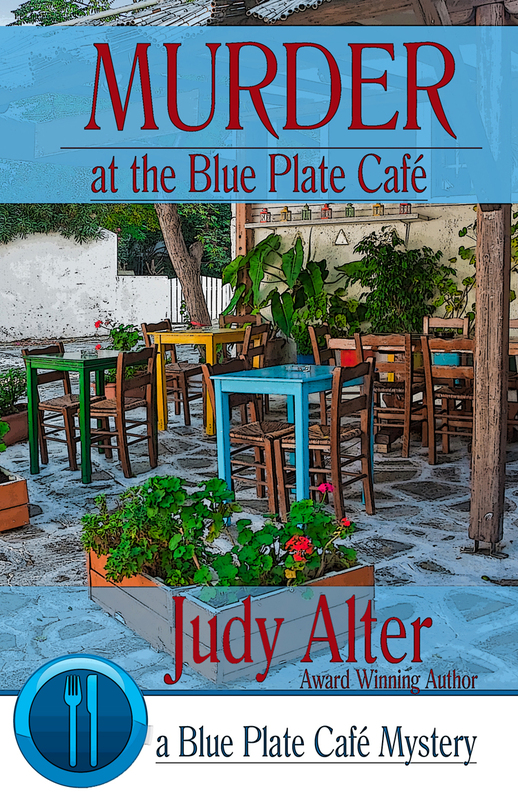 As Kate starts to take over the running of the café, she learns her grandmother’s death did not happen as her sister told her but rather by a sudden, violent illness. Kate believes she may have been murdered. She searches for clues as she tries to start a new life, keep her grandmother’s legacy alive and discovers that the little town she grew up is not quite the innocent, laid backwater town she once believed it to be. As we meet the conniving mayor who had a bitter feud with Gram to the whimpering CPA who suddenly has all control of Gram’s financial affairs to the inner family struggles and puzzles of what should be versus what is, we see Kate’s life change and evolve at the same time. This book was very interesting and fast paced. It made you think about one’s view of life and what is truly important. Also, when a primary figure in one’s life goes, what the ripple effects are, especially, when there is a mystery surrounding the sudden death of someone very important. I would highly recommend Ms. Alter’s book and enjoyed figuring out the mystery.